Ah, whenever new technologies appear, tech support is needed to help those along with the new skills required to operate it. 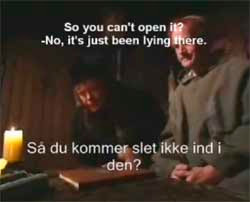 In this case, from some Euro comedy show, a medieval lad calls tech support for help with his new book. While it's amusing for mocking people's inability to understand the basics of modern computer technology -- "computers are that simple, and you look stupid asking for help" -- it should be taken as a reminder of why books will remain valuable and produced for years to come. Computers aren't as simple as a book. Books are such a simple and easy way to move huge amounts of data, that there's only minimal ways to improve it. The eBook technology brings two big improvements: text search and reduced printing costs. However, it adds the problems of user interface, limited transportation, software compatibilities, and, as the video shows, training to use. Pick up a book, and be glad -- you've got the technological skill to avoid ridicule by tech support. There's lots of places online that talk about how to bind a book, but this tutorial from the University of Indiana seems to be the best and most accurate I've seen. While the tutorial produces a rather generic library-quality rebound book, a little ingenuity and a variety of materials, including leather and such, could be used. For more book repair, check out their table of contents.